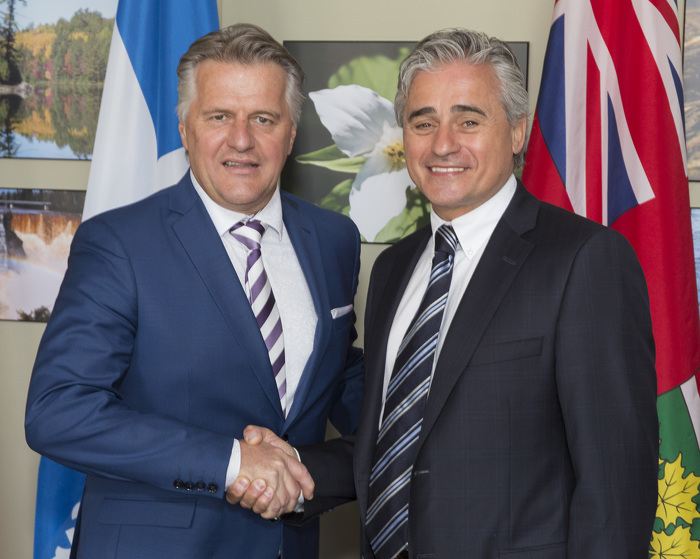 In reaffirming their commitment to cooperation, Bill Mauro, Ontario Minister of Natural Resources and Forestry, and Laurent Lessard, Québec Minister of Forests, Wildlife and Parks, agreed to keep working together on priority matters for the two provinces, including promoting sustainable forest management practices to support international trade in forest products and responsible approaches for the protection of species at risk. Last fall, Ontario and Québec signed a memorandum of understanding confirming their intention to reinvigorate and strengthen the Ontario-Québec Trade and Cooperation Agreement. With a combined GDP of more than $1 trillion, the Ontario-Québec region is the fourth largest in North America, after California, Texas and New York. Québec and Ontario are major economic players in Canada, accounting for nearly two thirds of its population, almost 60 per cent of its total production and 70 per cent of its manufacturing sector. Québecers and Ontarians occupy more than 70 per cent of the manufacturing jobs in Canada. Minister Mauro and Minister Lessard at Forestry Meeting.